The above items remained on the top of my dresser all day yesterday. Yesterday was a long day. I have EDC OCD. EDC is a buzzword of late. Well words. EDC stands for Every Day Carry. There are Facebook groups, blogs, websites, newsletters and even a niche industry devoted to crap one carries in their pockets or on their bodies everyday. Fancy pocket knives, sleek wallets, tiny high power flashlights. Solar powered smartphone chargers the size of a credit card. The coolest stuff has to be made from titanium or carbon fiber composites. Aircraft grade aluminum isn't cool enough anymore. The EDC embraces many lifestyles and demographics. Business men, techies, prepper type mall ninjas, hipsters, and even normal people. Not to sound like a hipster, but I've been doing this long before it was cool. In all fairness, I still don't do it as cool as the hipsters, techies and the mall ninjas do. I just carry stuff in my pants that I find handy enough to carry them all the time. 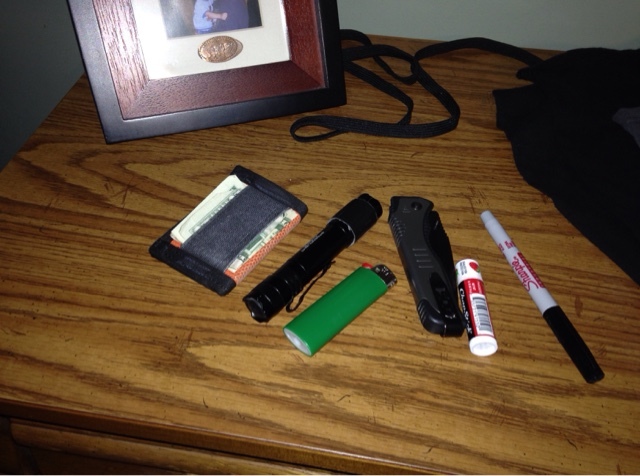 Wallet, pocket knife, sharpie marker, multi tool, lighter, flashlight and chapstick. I use all pretty much daily. Many of the above items since I was a little kid. A trait I picked up from my dad. I can remember from my youth that at night on a the kitchen counter, in a neat pile he'd have the items that were always on him when he left the house. Almost the same items as I have zhown above. This is where my OCD kicked in. I didn't realize I left the above items behind until I got to work yesterday, an hour from home. I was tempted to turn around and go back home to retrieve the items, wasting two hours of my life doing so. I survived the day without the above items. But thanks to my OCD I reached into my pockets just to check to see if items magically appeared during the day. It was a lot of times. If I didn't leave my Sharpie pen at home, I would have kept a tally.